Looking for an RC Mustang ? 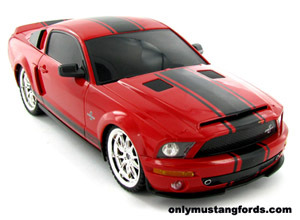 The best source for a diecast Mustang is also the best place to find an RC Mustang. 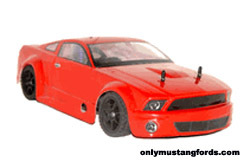 From fun battery powered rc cars for kids to all out race rigs like the nitro gas Saleen Mustang RC car below, we have what you need to enjoy the thrill of pony car ownership. The basics are below. For more detailed information including pricing, shipping and more, click on the blue link. 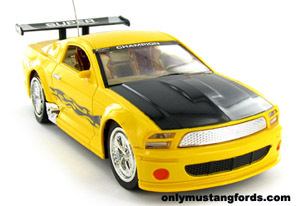 Check out this high performance nitro gas, an RC Saleen Mustang complete with a two speed transmission. This slick looking pony car is a remote controlled speed demon, capable of hitting 60 miles an hour and I don't mean scale mph ! It's equipped with an aluminum chassis, steel disc brakes and oil filled shocks and a centrifugal 2 speed shifted transmission. Just like a real Ford Mustang, there are loads of performance parts you can get to increase performance even more. If you prefer the 2005 to 2012 RC Mustang this Bright Red Ford Mustang race car has your name on it. Power to weight ratio is everything. And a full-on 1.5 horsepower nitro gas engine and ridiculously light weight, its easy to see how effortlessly this pony car can scream to 60 or 65 mph! Guaranteeing all that horsepower gets to the ground, this awesome RC race car is equipped with something even the full size new Mustang doesn't have - full time 4 wheel drive. Deck it out your way, with available accessories like high performance racing tires, upgraded suspension pieces and even go fast parts for the engine. It's an amazing car for the money. Here's a moderately priced and styled 1967 Ford Mustang GT - Mustang Eleanor RC car that's crafted in 1/24 scale. Here's your chance to own an incredible 2012 Boss 302 Mustang. This beautiful 1/16 scale Mustang Boss is a full on race rc car. Perfectly set up for the track or your driveway, this modern legend combines crisp handling with it's threaded body shocks, firm set coil-over springs and delivering its truly mind blowing power smoothly through it's telescoping u-joints, directly to the full time 4WD. Loud and Proud. 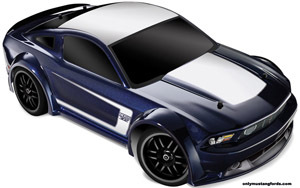 Kids love this wild looking new Mustang RTR electric RC car. It's just the thing for that special someone and a great starter for anyone's Mustang car collection, with cool LED lighting wheels, awesome stripes. Needs no expensive battery packs. Runs on inexpensive "AA" alkaline batteries. If you enjoyed Gone in 60 seconds, you'll like this cool Eleanor style 1967 Shelby Mustang GT500E . Phat wheels and slammed to the weeds, this car screams fast, even when it's not moving. Nice touches include a detailed interior, working headlights, independent suspension and a 12 volt charger pack. C'mon... Pull the trigger. Collectible and fun. It's a new Mustang GT500 Super Snake in red with matching black Shelby stripes. This Ford officially licensed car is ready to go, with road hugging rubber tires and a is available in 1/18 scale. The fun way to get snake bite.